If you are worried about the future of the US or the world, you need to attend a FIRST Robotics Challenge Competition. Your worries will dissolve into cheers for the moment and tears for the sheer beauty of kids doing amazing things – challenged and coached appropriately. 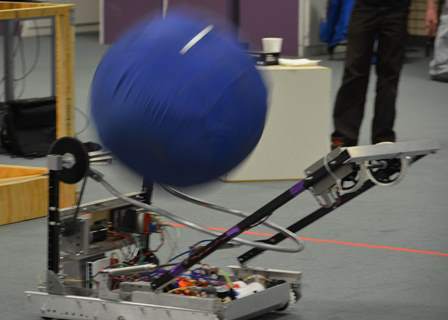 This year’s challenge isn’t quite the “hockey with robots” that we are used to. They have to stack bins and put a heavy container on top of them, a feat that challenges them to power great forces with intricate precision. It takes strategy, planning, and a lot of learning how to use power saws and drills. But the Great River School team 2491 No Mythic is hitting the challenge with great energy and determination. It’s also a lot of fun. 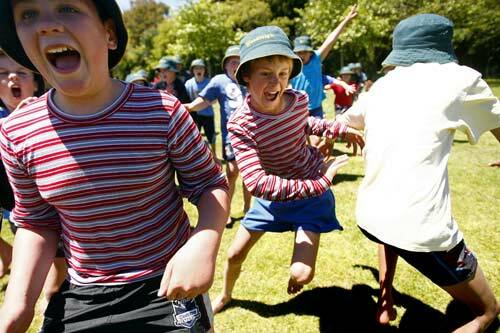 Kids playing “Bullrush” in New Zealand. It’s like rugby without a ball. A lot of people worry when kids are being kids. There is always the potential for serious injury when things get physical, as they often do. Perhaps it’s a rational fear of losing them or maybe it’s a symptom of a world that’s gotten horribly lawyered up, but most kids shuffle along through school under dark clouds of rules that limit what they can do. What they learn from the experience is that life is about rules, and those who can’t follow them for whatever reason are usually cast off as “trouble”. But a school in New Zealand tried something different out on the playground with their little ones. Swanson Primary School, near Aucklland, took part in a study by Auckland Tech and Otago University where they got rid of the formal playground and all of the rules. Recess became their own time to structure and play as they saw fit. Some more violent games like “bullrush” (which we knew as British Bulldog) came back as well as playing with sticks and other implements of destruction. The results were amazing. Disciplinary action declined substantially, and bullying incidents dropped to zero. Better yet, academic performance increased. Empathy became the lesson every day. The kids were happy and anything but sedentary sacks of cheeze-doodles. And no one was ever seriously hurt. This may seem very different from our experience with high school kids at Robotics League, but the experiences overlap. Let kids go out and figure out what they can do and they wind up doing amazing things. When they are young and simply need to blow off steam it may look dangerous, but it’s better than trying to bottle up the energy with a lot of rules. When they are older, they have to be encouraged and trusted regardless of the perceived “danger”. My role as a “mentor” is mainly to coach them along, but I also get my hands dirty. I also teach them really bad things like how to strip wires with their teeth. It takes way too much of my time, but the energy is infectious. I get more from them than they do from me. The kids came into this with different levels of experience. All of them have a hunger to learn how things are made, something that very much needs to be at least an option in their regular schooling. Yet the team itself is much more than skills, it is all about making something great happen. How else is the next generation going to learn how to do, how to lead, and how to make the world in their own image? Every parent worries about their kids getting into trouble, and there is certainly enough around when they are looking for it. In a rule-bound world where the kids are kept under control, however, all of them wind up on the wrong side of authority at some point – or at least learn to be in fear of the rules. Trouble only comes naturally to anyone who is constantly on a tightrope fearing a wrong step. Kids can do anything, if you let them. The only risk is how much you’re willing to be amazed. When kids are set free they tend to take care of themselves far better than any big set of rules ever could. With a little bit of coaching and encouragement the confidence they learn can be channeled into something great, like a team that can build a robot with dozens of acts of leadership shaping, forming, and building. It is the leadership that matters in the end. This year’s team has a fairly distributed style of leadership that works well for this generation – and has show how necessary an emphasis on strategy is to this model. Through attention to the master plan, leadership comes naturally from one task to the next as whoever has the skills to get it done steps up and takes their turn to make things happen. This team may be building a robot today, but tomorrow they’ll be doing even more amazing things. What happens when you turn kids loose to do what they do best? Anything. A good coach helps, but they are the ones who can design, build, and pilot their own machine – as they will do for the whole world one day soon. Let them learn their limits and abilities when the price of mistakes is just a few bruises. The only thing we adults have to fear is that they may make a world too fantastic for us to understand. 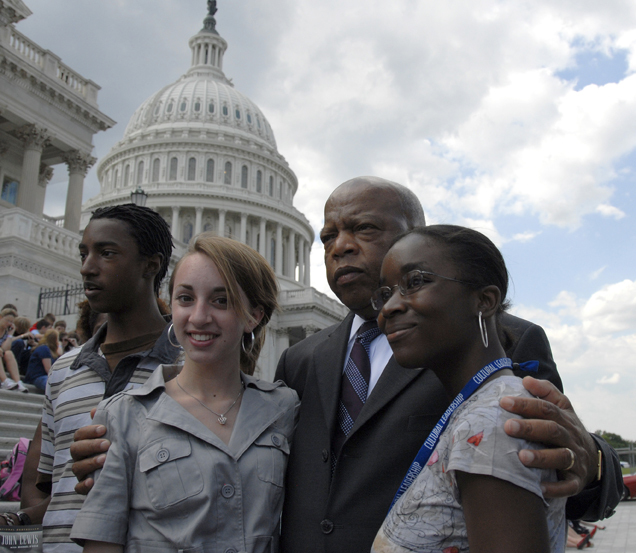 This entry was posted in People & Culture and tagged business, education, entrepreneurship, FIRST Robotics Challenge, kids, longreads, Next generation, robotics, technology, writing. Bookmark the permalink. Sounds really cool. Kids don’t learn how to do a lot of real job skills in school anymore. We once had shop and all the boys took it. Today I guess the girls should too. It was important to learn all that stuff because how could you walk into Home Depot without knowing something? I can only imagine who runs businesses these days if they don’t know these basic things. Kudos to being a part of that learning experience. Thanks, it is a lot of fun. And learning all these things is an amazing process. Kids today are a lot smarter and focused then we were. They impress me no end. I agree! I can’t wait for this generation to start running things. They are practical and dedicated. Kids need to learn these things. If this is how they do it today then more power to them. Good blog. This appears to be the best way to learn things like this, although I still think a program of Industrial Arts is essential in high schools. The future is hard to predict. I predicted 87 percent of those things will happen to my children. C’mon dude. Southwest minneapolis and all the stuff within a jog of Minnehaha Creek Park. Frank Lloyd Wright would like it. Humboldt ave s, Dupont ave s, Bryant Ave s. I rode my bike around there, saw it. I mean where are the lakes in St. Paul. Phalen lake and como? that is like in Roseville and maplewood haha, My dog used to love Minneapolis. A great article, Erik. My philosophy is much the same…give them the elastic boundries and see where the child/student goes. Nothing better. Thanks for following my poetry.